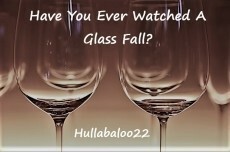 Have You Ever Watched A Glass Fall? Another fine take on the pic, Hull! Thanks, Mike. This was actually based on an experience this morning. Thanks, Nicks. Let's just say I had a 'smashing time' this morning. I love it!!!! So many things in life also seem to happen in the same way... Wonderful writing, Hully! Thanks, Bobi. Based on fact, but I could think of a totally different way of interpreting it too. This is a ‘shattering’ piece, Hully! Its fluid and brief, with fantastic imagery in the words, not just the photo. Loved it! Thanks, C A. Needless to say, I knocked down a glass and boy, could I relate to the crash. Thanks for giving this a read. Nice format for this piece. It seems to be how things go ninety-percent of the time with glass too - we can't save it before it shatters. Thanks, Jeff. First thing this morning I knocked a glass straight out of a high cupboard. Haha wowww!!! What a great smashing time you had!! Yep! Not much appreciated when I'd just woken up! Thanks so much for giving this a read, Nicks. .I Ask A Million Times.